Charts, Level II, Order entry windows, Time and Sales, Instrument Lists, and Market Analyzer windows all have the ability to begin typing in the window to display the Instrument Overlay Selector. The overlay instrument selector is a quick way to change or select an instrument. •To access the Overlay Instrument Selector with the window selected and in focus begin typing on the keyboard the symbol of the instrument you wish to select. In the below image you can see the Overlay Instrument Selector over the top of the superDOM window. •Once the symbol is typed in press "Enter" to complete the instrument selection or if you need assistance selecting the right instrument symbol then select the magnifying class. •Press the "Esc" key on your keyboard to cancel. Using these shortcuts you can quickly add an additional instrument or switch instruments. 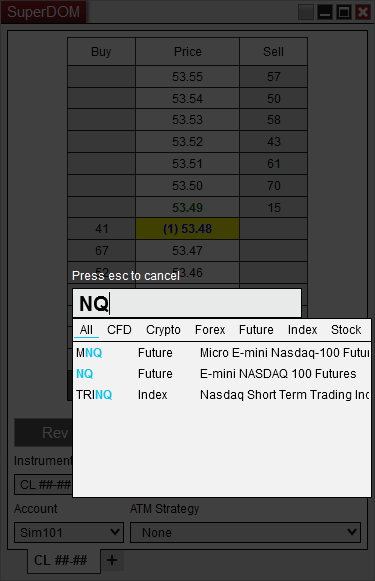 •Typing in a "+" at the start of the Instrument Symbol or Time Frame will tell NinjaTrader to add an additional instrument to the current tab if the window supports that. •Typing in a "++" on any tab will open a new tab with that instrument selected.